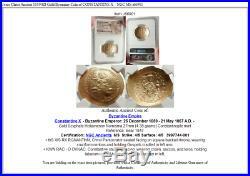 Item: i66901 Authentic Ancient Coin of. Byzantine Emperor: 25 December 1059 – 21 May 1067 A. 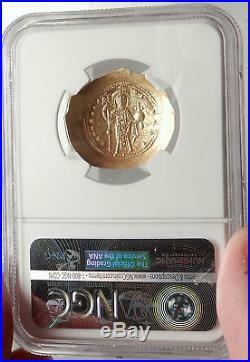 Gold Scyphate Histamenon Nomisma 27mm (4.38 grams) Constantinople mint Reference: Sear 1847 Certification: NGC Ancients. MS Strike: 4/5 Surface: 4/5 3997744-001 + IhS XIS RX RGNANTIhM, Christ Pantocrator seated facing on square-backed throne, wearing cruciform nimbus and holding Gospels cradled in left arm. + KWN RAC – O OVKAC, Constantine standing facing, wearing crown, saccos, and loros, holding labarum in right hand and globus cruciger in left. In Christian iconography, Christ Pantocrator refers to a specific depiction of Christ. Pantocrator or Pantokrator (Greek:) is, used in this context, a translation of one of many names of God in Judaism. When the Hebrew Bible was translated into Greek as the Septuagint, Pantokrator was used both for YHWH Sabaoth “Lord of Hosts” and for El Shaddai God Almighty. In the New Testament, Pantokrator is used once by Paul (2 Cor 6:18). Aside from that one occurrence, John of Patmos is the only New Testament author to use the word Pantokrator. The author of the Book of Revelation uses the word nine times, and while the references to God and Christ in Revelation are at times interchangeable, Pantokrator appears to be reserved for God except, perhaps, in 1:8. The most common translation of Pantocrator is “Almighty” or All-powerful. In this understanding, Pantokrator is a compound word formed from the Greek words , pas (GEN pantos), i. “All” and , kratos, i. This is often understood in terms of potential power; i. Ability to do anything, omnipotence. Another, more literal translation is “Ruler of All” or, less literally, “Sustainer of the World”. In this understanding, Pantokrator is a compound word formed from the Greek for “all” and the verb meaning “To accomplish something” or “to sustain something” (, kratein). This translation speaks more to God’s actual power; i. God does everything (as opposed to God can do everything). The Pantokrator, largely an Eastern Orthodox or Eastern Catholic theological conception, is less common by that name in Western (Roman) Catholicism and largely unknown to most Protestants. In the West the equivalent image in art is known as Christ in Majesty, which developed a rather different iconography. Christ Pantocrator has come to suggest Christ as a mild but stern, all-powerful judge of humanity. The icon of Christ Pantokrator is one of the most widely used religious images of Orthodox Christianity. Generally speaking, in Medieval eastern roman church art and architecture, an iconic mosaic or fresco of Christ Pantokrator occupies the space in the central dome of the church, in the half-dome of the apse or on the nave vault. Some scholars (Latourette 1975: 572) consider the Pantocrator a Christian adaptation of images of Zeus, such as the great statue of Zeus enthroned at Olympia. The development of the earliest stages of the icon from Roman Imperial imagery is easier to trace. The image of Christ Pantocrator was one of the first images of Christ developed in the Early Christian Church and remains a central icon of the Eastern Orthodox Church. In the half-length image, Christ holds the New Testament in his left hand and makes the gesture of teaching or of blessing with his right. The typical Western Christ in Majesty is a full-length icon that in the early Middle Ages usually showed Christ in a mandorla or other geometric frame, surrounded by the Four Evangelists or their symbols. The oldest known surviving example of the icon of Christ Pantocrator was painted in encaustic on panel in the sixth or seventh century, and survived the period of destruction of images during the Iconoclastic disputes that twice racked the Eastern church, 726 to 787 and 814 to 842, by being preserved in the remote desert of the Sinai, in Saint Catherine’s Monastery. The gessoed panel, finely painted using a wax medium on a wooden panel, had been coarsely overpainted around the face and hands at some time around the thirteenth century. It was only when the overpainting was cleaned in 1962 that the ancient image was revealed to be a very high quality icon, probably produced in Constantinople. The icon, traditionally half-length when in a semi-dome, which became adopted for panel icons also, depicts Christ fully frontal with a somewhat melancholy and stern aspect, with the right hand raised in blessing or, in the early encaustic panel at Saint Catherine’s Monastery, the conventional rhetorical gesture that represents teaching. The left hand holds a closed book with a richly decorated cover featuring the Cross, representing the Gospels. An icon where Christ has an open book is called “Christ the Teacher”, a variant of the Pantocrator. Christ is bearded, his brown hair centrally parted, and his head is surrounded by a halo. The icon is usually shown against a gold background comparable to the gilded grounds of mosaic depictions of the Christian emperors. Often, the name of Christ is written on each side of the halo, as IC and XC. Christ’s fingers are depicted in a pose that represents the letters IC, X and C, thereby making the Christogram ICXC (for “Jesus Christ”). The IC is composed of the Greek characters iota and lunate sigma (C; instead of ,)-the first and last letters of’Jesus’ in Greek ; in XC the letters are chi and again the lunate sigma-the first and last letters of’Christ’ in Greek. In many cases, Christ has a cruciform halo inscribed with the letters , i. Constantine X Doukas or Ducas (1006 – May, 1067) was emperor of the Byzantine Empire from 1059 to 1067. Constantine Doukas was the son of Andronikos Doukas, a Paphlagonian nobleman who may have served as governor of the theme of Moesia. Constantine gained influence after he married, as his second wife, Eudokia Makrembolitissa, the niece of Patriarch Michael Keroularios. In 1057, Constantine supported the usurpation of Isaac I Komnenos, but gradually sided with the court bureaucracy against the new emperor’s reforms. In spite of this tacit opposition, Constantine was chosen as successor by the ailing Isaac in November, 1059, under the influence of Michael Psellos. 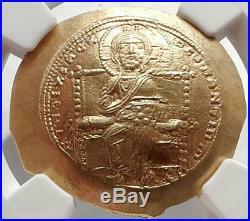 Isaac abdicated and on November 24, 1059, Constantine X Doukas was crowned emperor. The new emperor quickly associated two of his young sons in power, appointed his brother John Doukas as kaisar (Caesar) and embarked on a policy favorable to the interests of the court bureaucracy and the church. Severely undercutting the training and financial support for the armed forces, Constantine X fatally weakened Byzantine defences (by disbanding the Armenian local militia of 50,000 men) at a crucial point of time, coinciding with the westward advance of the Seljuk Turks and their Turcoman allies. Constantine lost most of Byzantine Italy to the Normans under Robert Guiscard, except for the territory around Bari, though a resurgence of interest in retaining Apulia occurred under his watch and he appointed at least four catepans of Italy: Miriarch, Maruli, Sirianus, and Mabrica. He also suffered invasions from Alp Arslan in Asia Minor in 1064 and the Uzes in the Balkans in 1065. Already old and unhealthy when he came to power, he died on May 22, 1067 and was succeeded by his young sons under the regency of their mother Eudokia Makrembolitissa. The Byzantine Empire , or Eastern Roman Empire , was the predominantly Greek-speaking eastern half continuation and remainder of the Roman Empire during Late Antiquity and the Middle Ages. Its capital city was Constantinople (modern-day Istanbul), originally founded as Byzantium. It survived the fragmentation and fall of the Western Roman Empire in the 5th century AD and continued to exist for an additional thousand years until it fell to the Ottoman Turks in 1453. During most of its existence, the empire was the most powerful economic, cultural, and military force in Europe. Both “Byzantine Empire” and “Eastern Roman Empire” are historiographical terms created after the end of the realm; its citizens continued to refer to their empire as the Roman Empire Ancient Greek: , tr. Basileia Rhmain ; Latin: Imperium Romanum , or Romania , and to themselves as “Romans”. Several events from the 4th to 6th centuries mark the transitional period during which the Roman Empire’s east and west divided. In 285, the emperor Diocletian r. 284-305 partitioned the Roman Empire’s administration into eastern and western halves. Between 324 and 330, Constantine I r. 306-337 transferred the main capital from Rome to Byzantium, later known as Constantinople (“City of Constantine”) and Nova Roma (“New Rome”). Under Theodosius I r. 379-395, Christianity became the Empire’s official state religion and others such as Roman polytheism were proscribed. And finally, under the reign of Heraclius r. 610-641, the Empire’s military and administration were restructured and adopted Greek for official use instead of Latin. Thus, although it continued the Roman state and maintained Roman state traditions, modern historians distinguish Byzantium from ancient Rome insofar as it was oriented towards Greek rather than Latin culture, and characterised by Orthodox Christianity rather than Roman polytheism. The borders of the Empire evolved significantly over its existence, as it went through several cycles of decline and recovery. During the reign of Justinian I r. 527-565, the Empire reached its greatest extent after reconquering much of the historically Roman western Mediterranean coast, including north Africa, Italy, and Rome itself, which it held for two more centuries. During the reign of Maurice r. 582-602, the Empire’s eastern frontier was expanded and the north stabilised. However, his assassination caused a two-decade-long war with Sassanid Persia which exhausted the Empire’s resources and contributed to major territorial losses during the Muslim conquests of the 7th century. In a matter of years the Empire lost its richest provinces, Egypt and Syria, to the Arabs. During the Macedonian dynasty (10th-11th centuries), the Empire again expanded and experienced a two-century long renaissance, which came to an end with the loss of much of Asia Minor to the Seljuk Turks after the Battle of Manzikert in 1071. This battle opened the way for the Turks to settle in Anatolia as a homeland. The final centuries of the Empire exhibited a general trend of decline. It struggled to recover during the 12th century, but was delivered a mortal blow during the Fourth Crusade, when Constantinople was sacked and the Empire dissolved and divided into competing Byzantine Greek and Latin realms. Despite the eventual recovery of Constantinople and re-establishment of the Empire in 1261, Byzantium remained only one of several small rival states in the area for the final two centuries of its existence. Its remaining territories were progressively annexed by the Ottomans over the 15th century. The Fall of Constantinople to the Ottoman Empire in 1453 finally ended the Byzantine Empire. World-renowned expert numismatist, enthusiast, author and dealer in authentic ancient Greek, ancient Roman, ancient Byzantine, world coins & more. Ilya Zlobin is an independent individual who has a passion for coin collecting, research and understanding the importance of the historical context and significance all coins and objects represent. Send me a message about this and I can update your invoice should you want this method. Getting your order to you, quickly and securely is a top priority and is taken seriously here. Great care is taken in packaging and mailing every item securely and quickly. What is a certificate of authenticity and what guarantees do you give that the item is authentic? You will be very happy with what you get with the COA; a professional presentation of the coin, with all of the relevant information and a picture of the coin you saw in the listing. Additionally, the coin is inside it’s own protective coin flip (holder), with a 2×2 inch description of the coin matching the individual number on the COA. Whether your goal is to collect or give the item as a gift, coins presented like this could be more prized and valued higher than items that were not given such care and attention to. When should I leave feedback? Please don’t leave any negative feedbacks, as it happens sometimes that people rush to leave feedback before letting sufficient time for their order to arrive. The matter of fact is that any issues can be resolved, as reputation is most important to me. My goal is to provide superior products and quality of service. How and where do I learn more about collecting ancient coins? Visit the Guide on How to Use My Store. For on an overview about using my store, with additional information and links to all other parts of my store which may include educational information on topics you are looking for. 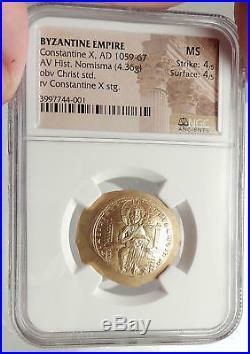 The item “Jesus Christ Ancient 1059AD Gold Byzantine Coin of CONSTANTINE X NGC MS i66901″ is in sale since Saturday, January 27, 2018. 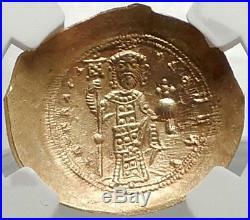 This item is in the category “Coins & Paper Money\Coins\ Ancient\Byzantine (300-1400 AD)”. The seller is “highrating_lowprice” and is located in Rego Park, New York. This item can be shipped worldwide.